A remarkable example of Italian religious folk art and culture has been lovingly developed in Rosebank. 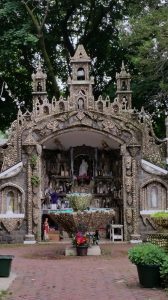 Located on a quaint, dead-end lane “The Shrine of Our Lady of Mount Carmel” is a peaceful grotto that all should visit. Catholic or not, the setting evokes a sense of amazement and emotion when one sees the devotional setting that now exists at this location. Main section of “The Our Lady of Mount Carmel Shrine,” 2017. “The Shrine of our Lady of Mount Carmel” is located on Amity Street, just off of Saint Mary’s Avenue. In the past, the Catholic poor of southern Italy were not entirely comfortable with the Catholic Church. They were suspicious of the church’s hierarchy and sometimes avoided worshipping in organized settings. 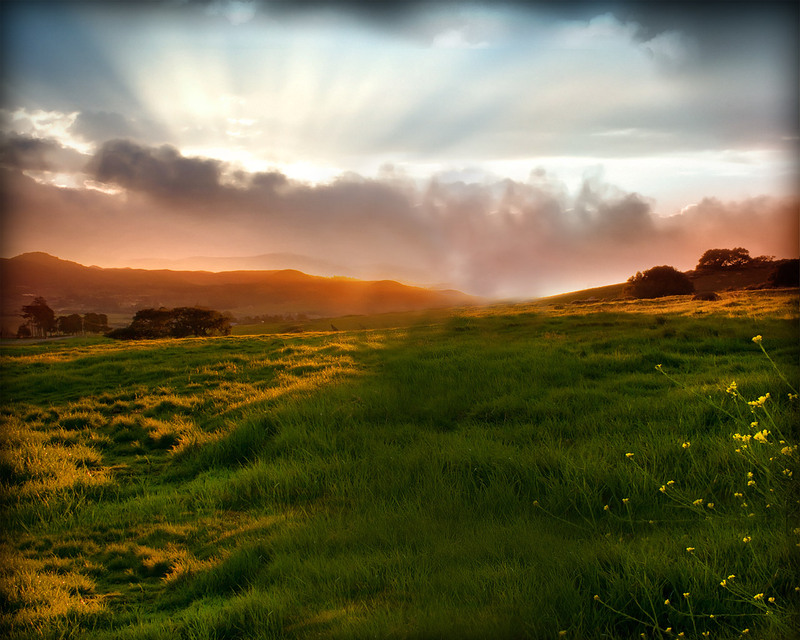 Instead, secluded sanctuaries were created for religious devotions. Oftentimes, they were established in caves or in constructed cave-like memorials. Hence, the word grotto is sometimes used to describe these manmade holy places, since grotto refers to a natural hollow. 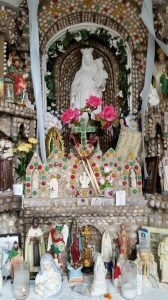 Various materials, manufactured and from nature, were used by the men who built “The Shrine of Our Lady of Mount Carmel.” These included shells, stones, pebbles, marbles, bicycle reflectors, and a number of unidentifiable glass and plastic objects. Some of the men who built the shrine were involved in masonry, others were simply amateur artists who used their religious piety as a how-to-guide for creating a hallow religious retreat. Statue of Saint Barbara, 2017. Vito Louis Russo began construction on the shrine in 1937. Some believe the undertaking resulted from the death of his five-year-old son. Mr. Russo was assisted by Thomas Tedesco who was an employee of the nearby DeJonge factory where he made wall paper and gift wrap. Many of the stones and pebbles were first collected on South Beach and then hand-polished. The shrine grew and by the mid-1990’s there were more than seventy statues incorporated into the design. Additional arches were also added. Various statuary in the main section, 2017. Our Lady of Mount Carmel is one of several titles given to the Virgin Mary. Others include “Our Lady of Fatima,” “Our Lady of Lourdes,” “Our Lady of Guadalupe,” “Madonna,” and the “Blessed Mother.” Additional names and designations also exist. Today, worshippers leave funeral prayer cards, Rosary Beads, figurines, and lit candles that sparkle to the memory of their loved ones at the grotto. The main shrine now includes a number of side niches, smaller surrounding devotional areas, and a fountain that instills tranquility. 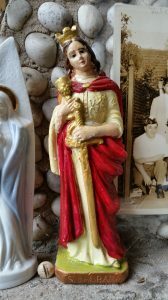 Those familiar with the Catholic faith will recognize many of the sacred statues including Saint Jude, Saint Barbara, Saint Anthony, Saint Martin, and the Madonna in various honorific styles. On November 2, 2000, a great distinction was bestowed on the site when it was added to the National and New York Registers of Historic Places. The Our Lady of Mount Carmel Society of Rosebank, on whose property the shrine is located, hold an annual commemoration that began in 1903. As part of the celebration a procession glides through Rosebank on the Feast of Our Lady of Mount Carmel, which always takes place on July 16. The festivities feature games, food, rides, dancing and music. It is a true celebration of Italian cultural heritage. Many families have been attending for decades. Mini-grotto adjacent to the main shrine, 2017. Special thanks to Gina Sacco, Barbara Scalici, Tina Kaasmann, Edwin Calderon, “Irish Ryan,” and Robert Bennett. Mark your calendars… What better time to visit the Shrine then during the festival? Chase, Sheila. “A Spiritual People.” Staten Island Advance. October 22, 1984. Monahan, Geoffrey. “The Old Neighborhoods Remembered.” Staten Island Advance. October 15, 1984. Sollett, Peter. “Mount Carmel Festival Opens in Rosebank.” Staten Island Advance. July 8, 1995. “WEEKLY LIST OF ACTIONS TAKEN ON PROPERTIES: 10/30/00 THROUGH 11/03/00” NEW YORK, RICHMOND COUNTY, Our Lady of Mount Carmel Grotto, 36 Amity St., Staten Island.” Accessed at http://www.nps.gov/nr/listings/20001109.htm on April 16, 2010. 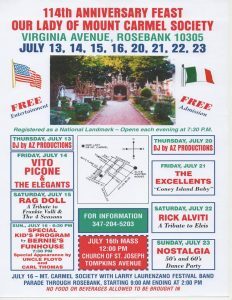 [i] Sollett, Peter, “Mount Carmel Festival Opens in Rosebank,” Staten Island Advance, July 8, 1995. Thanks for the mention… mama’s people were the Festa family. they lived on Virginia Ave (next door to the Russo family)… my grandpa was a stone mason who contributed to the building and expansion of the shrine. He passed in 1968, an honorable WWI veteran of the Lost Batallion. Thanks for writing Barbara. I am wondering how the feast has changed in the last few decades? I imagine you and your family attended? Somewhere we have a picture of my oldest sister riding in the float during the parade of virgins that kicked off the celebration. Out Lady of Mt Carmel was the patron Saint of the part of Italy where my grandparents originated. The most significant change is more of a sentimental one geared toward the taste buds… Grandpa Festa used to take us down (not even a 2 block walk) and buy each of us a string of hazel nuts. He would also have them chop off a big hunk of nougat with a hammer. He would take it home and hammer the block into small pieces which we would all enjoy. They stopped selling these 2 items… Mom would buy small bags of roasted chick peas (cheech-ata beans). They were freshly roasted. Now they taste stale. We would always try to get mom to buy is the cupie doll on a stick – actually it was more like a fishing pole… The grotto just seemed to get bigger every year and now it doesn’t seem as big as I remember. The zeppoli is still good. And I certainly don’t remember anything but Italian music. The Elvis impersonator now comes every year and he really is terrific (Rick Alviti). I don’t remember so many games but we always had the “whip” ride. All in all, it hasn’t really changed much. Grandparents came from Italy, settled in Rosebank. Can remember as a child, late 50s and early 60’s, going to the feast, buying chichi beans and seeing the shrine. Probably started the day at South Beach rides and a lemon ice from LaRosa. Hello Lisa. Love the memories. Thank you for sharing! Very interesting write up. Evvie and I visited this shrine a few years back. Then we had a delicious lunch in a small café on Bay St. Fun times! Always good to read your articles. Thanks! Thanks for writing Beth. Always good to hear about Evvie memories too 🙂 It is gone now, but Aesop’s Table was nearby on Bay Street. What a popular spot it was and what great meals they served up. Rosebank is a fascinating enclave. I hope all is well with you! Wonderful story. I’ve known about the Shrine since I moved to Staten Island over 40 years ago but have never been. After reading your story I will make every effort to visit. That is good news. Thank you Elaine! Thank you so much for writing Margo. I appreciate that you shared your history and memories. Rosebank is a special neighborhood and the Shrine is “the icing on the cake.” I enjoy the narrow lanes that are still present, but I did notice with sadness that many of the old houses have been replaced by modern structures. Thank goodness the shrine has survived! Would you like me to add your email address to my mailing list? I send out announcements about blogs like this, Staten Island history programs, events, publications, booklets etc. Ahhhhh the sausage and peppers. I bet they are the best. Thank you for sharing Lisa! This sounds like so much fun! I checked the website, but it still has last year’s event posted – will there be another festival this year? This is amazing information! I am looking forward to visiting the site for the first time with my grandmother, thanks to you. blog: I lived through 1954, until age six and a half, on Virginia Avenue upstairs from my immigrant grandparents, Angelo and Rose Festa in a house built by grandma’s father. Next door was Russo, then Williams, then a small house set far back from the sidewalk, then an empty downhill field that ended with the Mount Carmel feastground surrounded by a chain link fence. 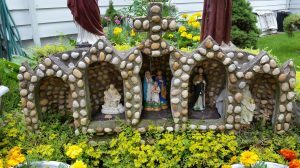 The all grass site was empty except for the very decorative small stone and seashell grotto monument to the Blessed Mother. I think were protective angels as part of it. Grandpa Angelo was a stone mason who, with other locals, helped build it. A wooden meeting hall, attached to the Mt. Carmel property stood alongside opening to the Saint Mary’s Avenue end of the grounds. As for the feast – I don’t remember if anything went on in daylight hours, but after supper hour, the Rosebank world came vividly alive. From outside our house uphill of the feast site, colored lights glowed in the loom of steamy summer air where the night celebration began. And as people streamed up Virginia Avenue from anywhere and everywhere, band music and the proud voices of Italian singers resonated their native language songs through speakers to blocks around. We joined the festival, and I don’t think we ever missed a night. Coming to it from Virginia Avenue, was first the back of the bandstand, then the crowded layout of folding chairs where all sat with happy attention and hand clapping to the rhythm. Through the gate on the left, were a couple of food tents before the walkway up to the grotto and benches along a flat cement gathering area outside the meeting hall where basement bathrooms were open. While colored lights hung overhead all around, the grotto, it seems, was all candles where money was pinned onto strategic locations just for the purpose. One other related bit to Mt. Carmel, at least for me, was what we called “the chicken slaughter house” a single story featureless building that abutted the Mt. Carmel property along Virginia Avenue. Its front had a blank, solid green door and the word Poultry painted between the shallow peaked roof. Important because grandpa Angelo took me with him on Saturdays when he went to buy a Sunday chicken. I followed next to him barely able to see above the counter and watch mesmerized every moment from a man in a white apron reach into a cage for a live chicken held by the feet that grandpa would nod ok or gesture a bigger one to the head chopped off on a wooden table to a a knife slit up the belly and set aside of liver heart and kidneys to its descent into a giant steaming cauldron and feather plucking to its dip and wash in cold water to its cut to order or left whole and wrap up with innards reunited. Back outside, the building returned to its featureless innocent appearance. Some days we’d walk on to the Cardinal Club, a neighborhood bar where he’d Italian talk with friends while I sat sipping a coke and marvel. He never talked more than a few words ata time at home with his strong accent and strange pronunciations. But I always understood and feel blessed for all the times I had with him. As a teen, after my family moved from Rosebank, I spent time in the old neighborhood where a close cousin still lived, and he with a large group of neighborhood friends held dance parties in the hall. More great times. Good for him and good for you Barbara. Get the information out there. That is what I say…!